Is social networking bad for our friendships? So, is social networking bad for our friendships? You know, the real life friends. Where you actually meet up with people? I have no doubt that social networking is good for the friends I meet inside my computer - there are so many people I wouldn't have had the pleasure of encountering without, for example, Twitter. The other week I met with a friend for coffee. I started to tell her about something which had happened in the week. She stopped me and said, "yes, I saw it on Facebook". That was the end of the conversation. I find it quite sad though that you start telling someone a story only to find out that they read it on facebook, and therefore don't want to hear the full story because they think they know it already! More often than not, I tell my friends a fuller version of what I put on Facebook. We spend so much time on social networking sites compared with actual time out with our friends and it does seem such a shame that they already 'know' what's going on in your life. I am not someone who constantly updates their facebook (maybe once every four or five days), and there are very few people who actually know me who are my friends on Twitter (fewer than 5). It got me thinking about over-sharing. Is it possible that we are sharing too much information with everyone? Knowing what others are doing all the time can't be good for us. Is there not a risk of extreme over-crowding in our already jam packed brains? Where will the space be for reading good literature, learning new and important information? How do we turn our brains off to the constant tweets, facebook updates and general gossip? How do I stop asking questions no-one can answer? Someone who's blog I follow has gone incognito for two weeks. 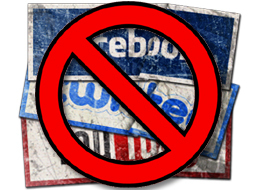 No Facebook, Twitter or blogging. I'm not sure I could go cold turkey, but I think it's a great idea. One day, maybe I can do it too! What do you think? Is social networking bad for our friendships?